Hoarding is not just drama created for television. It is a very real issue that more people than you realize suffer from. Hoarders typically pack their homes with so much stuff that it starts to interfere with daily function and maintenance. This creates a very dangerous and unsanitary environment for the hoarder and any occupants of the space. Cleanup of a hoarder’s property often requires professional assistance due to the sheer difficulty of the task and potential safety hazards. Very rarely is cleanup initiated by the hoarder. Often times, it is family or friends who push for that first step towards cleanup of the property. 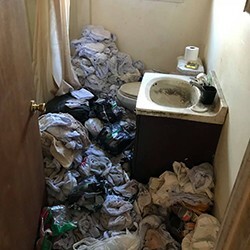 But regardless if you are the hoarder coming to terms with your compulsion or if you are a loved one assisting in the process, it is important to understand that an effective cleanup is a very involved process due to the physical difficulty, the safety risks and the overall emotional stress of the situation. It is important to proceed with caution and avoid underestimating how big of challenge it may be. In cases of extreme hoarding, it is advised to consult a hoarding cleanup company in New Jersey for professional assistance. Cleanup of a distressed property in New Jersey like that of a hoarder means more than just throwing out some junk, wiping down some counters and vacuuming. Hoarding situations lead to a variety of sanitation concerns, safety risks and maintenance problems. Safety Risks: The safety hazards involved with hoarding in New Jersey includes, but is not limited to, fire hazards, lack of egress, injury risks and health risks. Maintenance Problems: The clutter makes it nearly impossible to properly conduct the necessary maintenance assessments throughout the home. There is often a myriad of underlying maintenance issues involved with hoarding (i.e: leaks, broken appliances, etc.). If you or a loved one is in need of professional hoarding cleanup services, Mastertech Environmental can help. Our specially trained team provides the safest and most effective hoarding cleanup services in South Jersey and throughout the New Jersey area. Our cleanup technicians have the necessary equipment and training to effectively restore the property to safe and livable conditions. Our team is trained to follow strict safety standards and will utilize appropriate personal protective gear and respiratory protection.